Goundamani is probably the most memorable and best comedian the Tamil Film Industry has ever produced. He ruled the roost from the late 1970′s to 2000 in Tamil Cinema and redefined Tamil film comedy with his unique style. He teamed up with Senthil to produce the best comedy team in the history of Tamil Cinema. Goundamani also known as Koundamani, is known for his typical style of dialogue delivery and variety in comedy. He entertained the people of Tamil Nadu with his different styles of comedy such as SlapStick, double entendre, irony, satire and sarcasm. He is best known for his “lollu”, “nakkal” jokes and “Coimbatore Kusumbu”. Goundamani is a household name in Tamil Nadu, India and his name always goes in hand with Senthil another Tamil Comedian who was his sidekick in numerous movies. Goundamani had a strong theatrical background. This helped him in gaining entry into the Tamil Movie Industry. Initially he did solo comedy in movies such as “16 Vayadhinilae”. Goundamani has also acted as a villian in a few movies and as a hero in a some movies. He was a very good actor being able to adapt to the situation in the movie. His fame reached dizzying heights when he teamed up with Senthil in the super hit blockbuster movie “Karagattakkaran”.The duo’s antics in the movie, the way in which Senthil always lands Goundamani in trouble or irritates him and the ever green “Valzhaipalam” joke took the Tamil Movie world by storm. It changed the career of Goundamani and Senthil. Now they were no longer just another set of comedians but an integral part of a movie’s success. It was to be their first among the scores of movies they acted together, entertaining people with their hilarious comedy. The Goundamani Senthil combination became virtually unbeatable throughout the 1990′s. Any Tamil movie with both of them was bound to be a success. Some of their most famous movies include Gentleman, Indian, Nattaamai etc. Senthil would always land up Goundamani in trouble or irritate him to the maximum. Or ask some of the most stupid doubts and will end up receving kicks from Goundamani; the way they carried out their brand of comedy was very entertaining and the people lapped it up. Goundamani and Senthil in the famous Vaalzhai Palzham comedy (banana) scene from the movie Karagattakaaran. Goundamani also successfully teamed up with other popular heroes like Rajinikanth, Kamala Hassan, Satyraj, Karthik and Arjun. He was also very successfull with Satyaraj and both of them teamed up in many hit movies. 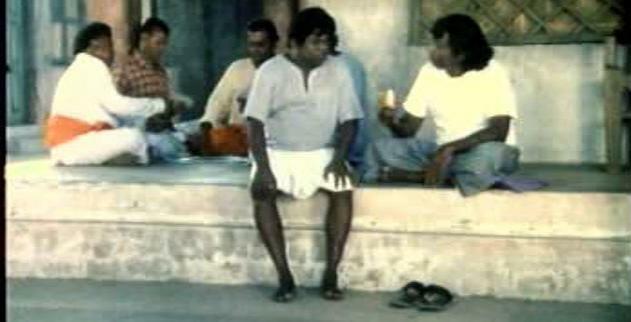 Comedians like Vivek, Vadivel have also acted with Goundamani. Goundamani started acting in fewer movies after 2002 and there was a period of time when he almost stopped acting. Some of his recent movies are Thangam and Suyetchai MLA in which he teams up with Satyaraj. Recently his daughter Sunitha was married to Venkatachalam in Chennai.